This article is about the company. For the information gathering term, see Intelligence assessment. For other uses, see Intel (disambiguation). Intel Corporation (commonly known as Intel and stylized as intel) is an American multinational corporation and technology company headquartered in Santa Clara, California, in the Silicon Valley. 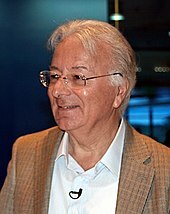 It is the world's second largest and second highest valued semiconductor chip manufacturer based on revenue after being overtaken by Samsung, and is the inventor of the x86 series of microprocessors, the processors found in most personal computers (PCs). Intel ranked No. 46 in the 2018 Fortune 500 list of the largest United States corporations by total revenue. Intel Corporation was founded on July 18, 1968, by semiconductor pioneers Robert Noyce and Gordon Moore (of Moore's law), and widely associated with the executive leadership and vision of Andrew Grove. The company's name was conceived as portmanteau of the words integrated and electronics, with co-founder Noyce having been a key inventor of the integrated circuit (microchip). The fact that "intel" is the term for intelligence information also made the name appropriate. Intel was an early developer of SRAM and DRAM memory chips, which represented the majority of its business until 1981. Although Intel created the world's first commercial microprocessor chip in 1971, it was not until the success of the personal computer (PC) that this became its primary business. The Open Source Technology Center at Intel hosts PowerTOP and LatencyTOP, and supports other open-source projects such as Wayland, Mesa3D, Intel Array Building Blocks, and Threading Building Blocks (TBB), and Xen. Internet of Things Group – 5% of 2016 revenues – offers platforms designed for retail, transportation, industrial, buildings and home use. In 2017, Dell accounted for about 16% of Intel's total revenues, Lenovo accounted for 13% of total revenues, and HP Inc. accounted for 11% of total revenues. According to IDC, while Intel enjoyed the biggest market share in both the overall worldwide PC microprocessor market (73.3%) and the mobile PC microprocessor (80.4%) in the second quarter of 2011, the numbers decreased by 1.5% and 1.9% compared to the first quarter of 2011. In the 1980s, Intel was among the top ten sellers of semiconductors (10th in 1987) in the world. In 1992, Intel became the biggest chip maker by revenue and has held the position ever since. Other top semiconductor companies include TSMC, Advanced Micro Devices, Samsung, Texas Instruments, Toshiba and STMicroelectronics. Competitors in PC chipsets include Advanced Micro Devices, VIA Technologies, Silicon Integrated Systems, and Nvidia. Intel's competitors in networking include NXP Semiconductors, Infineon, Broadcom Limited, Marvell Technology Group and Applied Micro Circuits Corporation, and competitors in flash memory include Spansion, Samsung, Qimonda, Toshiba, STMicroelectronics, and SK Hynix. The only major competitor in the x86 processor market is Advanced Micro Devices (AMD), with which Intel has had full cross-licensing agreements since 1976: each partner can use the other's patented technological innovations without charge after a certain time. However, the cross-licensing agreement is canceled in the event of an AMD bankruptcy or takeover. Some smaller competitors such as VIA Technologies produce low-power x86 processors for small factor computers and portable equipment. However, the advent of such mobile computing devices, in particular, smartphones, has in recent years led to a decline in PC sales. Since over 95% of the world's smartphones currently use processors designed by ARM Holdings, ARM has become a major competitor for Intel's processor market. ARM is also planning to make inroads into the PC and server market. Intel has been involved in several disputes regarding violation of antitrust laws, which are noted below. Intel was founded in Mountain View, California, in 1968 by Gordon E. Moore (of "Moore's law" fame), a chemist, and Robert Noyce, a physicist and co-inventor of the integrated circuit. Arthur Rock (investor and venture capitalist) helped them find investors, while Max Palevsky was on the board from an early stage. Moore and Noyce had left Fairchild Semiconductor to found Intel. Rock was not an employee, but he was an investor and was chairman of the board. The total initial investment in Intel was $2.5 million convertible debentures and $10,000 from Rock. Just 2 years later, Intel became a public company via an initial public offering (IPO), raising $6.8 million ($23.50 per share). Intel's third employee was Andy Grove, a chemical engineer, who later ran the company through much of the 1980s and the high-growth 1990s. In deciding on a name, Moore and Noyce quickly rejected "Moore Noyce", near homophone for "more noise" – an ill-suited name for an electronics company, since noise in electronics is usually undesirable and typically associated with bad interference. Instead, they founded the company as N M Electronics on July 18, 1968, but by the end of the month had changed the name to Intel which stood for Integrated Electronics. Since "Intel" was already trademarked by the hotel chain Intelco, they had to buy the rights for the name. At its founding, Intel was distinguished by its ability to make logic circuits using semiconductor devices. The founders' goal was the semiconductor memory market, widely predicted to replace magnetic-core memory. Its first product, a quick entry into the small, high-speed memory market in 1969, was the 3101 Schottky TTL bipolar 64-bit static random-access memory (SRAM), which was nearly twice as fast as earlier Schottky diode implementations by Fairchild and the Electrotechnical Laboratory in Tsukuba, Japan. In the same year, Intel also produced the 3301 Schottky bipolar 1024-bit read-only memory (ROM) and the first commercial metal–oxide–semiconductor field-effect transistor (MOSFET) silicon gate SRAM chip, the 256-bit 1101. While the 1101 was a significant advance, its complex static cell structure made it too slow and costly for mainframe memories. The three-transistor cell implemented in the first commercially available dynamic random-access memory (DRAM), the 1103 released in 1970, solved these issues. The 1103 was the bestselling semiconductor memory chip in the world by 1972, as it replaced core memory in many applications. Intel's business grew during the 1970s as it expanded and improved its manufacturing processes and produced a wider range of products, still dominated by various memory devices. While Intel created the first commercially available microprocessor (Intel 4004) in 1971 and one of the first microcomputers in 1972, by the early 1980s its business was dominated by dynamic random-access memory chips. However, increased competition from Japanese semiconductor manufacturers had, by 1983, dramatically reduced the profitability of this market. The growing success of the IBM personal computer, based on an Intel microprocessor, was among factors that convinced Gordon Moore (CEO since 1975) to shift the company's focus to microprocessors and to change fundamental aspects of that business model. Moore's decision to sole-source Intel's 386 chip played into the company's continuing success. The development of the micro-processor by Intel, (1971): The micro-processor represented a notable advance in the technology of integrated circuitry. 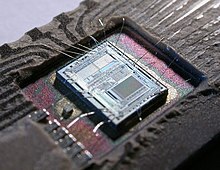 A micro-processor miniaturized the central processing unit of a computer, which then made it possible for small machines to perform calculations that in the past only very large machines could do. Considerable technological innovation was needed before the micro-processor could actually become the basis of what was first known as a "mini computer" and then known as a "personal computer". By the end of the 1980s, buoyed by its fortuitous position as microprocessor supplier to IBM and IBM's competitors within the rapidly growing personal computer market, Intel embarked on a 10-year period of unprecedented growth as the primary (and most profitable) hardware supplier to the PC industry, part of the winning 'Wintel' combination. Moore handed over to Andy Grove in 1987. By launching its Intel Inside marketing campaign in 1991, Intel was able to associate brand loyalty with consumer selection, so that by the end of the 1990s, its line of Pentium processors had become a household name. After 2000, growth in demand for high-end microprocessors slowed. Competitors, notably AMD (Intel's largest competitor in its primary x86 architecture market), garnered significant market share, initially in low-end and mid-range processors but ultimately across the product range, and Intel's dominant position in its core market was greatly reduced. In the early 2000s then-CEO, Craig Barrett attempted to diversify the company's business beyond semiconductors, but few of these activities were ultimately successful. Intel had also for a number of years been embroiled in litigation. US law did not initially recognize intellectual property rights related to microprocessor topology (circuit layouts), until the Semiconductor Chip Protection Act of 1984, a law sought by Intel and the Semiconductor Industry Association (SIA). During the late 1980s and 1990s (after this law was passed), Intel also sued companies that tried to develop competitor chips to the 80386 CPU. The lawsuits were noted to significantly burden the competition with legal bills, even if Intel lost the suits. Antitrust allegations had been simmering since the early 1990s and had been the cause of one lawsuit against Intel in 1991. In 2004 and 2005, AMD brought further claims against Intel related to unfair competition. In 2005, CEO Paul Otellini reorganized the company to refocus its core processor and chipset business on platforms (enterprise, digital home, digital health, and mobility). In 2006, Intel unveiled its Core microarchitecture to widespread critical acclaim; the product range was perceived as an exceptional leap in processor performance that at a stroke regained much of its leadership of the field. In 2008, Intel had another "tick" when it introduced the Penryn microarchitecture, which was 45 nm. Later that year, Intel released a processor with the Nehalem architecture. Nehalem had positive reviews. On June 27, 2006, the sale of Intel's XScale assets was announced. Intel agreed to sell the XScale processor business to Marvell Technology Group for an estimated $600 million and the assumption of unspecified liabilities. The move was intended to permit Intel to focus its resources on its core x86 and server businesses, and the acquisition completed on November 9, 2006. In 2010, Intel purchased McAfee, a manufacturer of computer security technology, for $7.68 billion. As a condition for regulatory approval of the transaction, Intel agreed to provide rival security firms with all necessary information that would allow their products to use Intel's chips and personal computers. After the acquisition, Intel had about 90,000 employees, including about 12,000 software engineers. In September 2016, Intel sold a majority stake in its computer-security unit to TPG Capital, reversing the five-year-old McAfee acquisition. In August 2010, Intel and Infineon Technologies announced that Intel would acquire Infineon's Wireless Solutions business. Intel planned to use Infineon's technology in laptops, smart phones, netbooks, tablets and embedded computers in consumer products, eventually integrating its wireless modem into Intel's silicon chips. In March 2011, Intel bought most of the assets of Cairo-based SySDSoft. In July 2011, Intel announced that it had agreed to acquire Fulcrum Microsystems Inc., a company specializing in network switches. The company used to be included on the EE Times list of 60 Emerging Startups. In October 2011, Intel reached a deal to acquire Telmap, an Israeli-based navigation software company. The purchase price was not disclosed, but Israeli media reported values around $300 million to $350 million. In July 2012, Intel agreed to buy 10% of the shares of ASML Holding NV for $2.1 billion and another $1 billion for 5% of the shares that need shareholder approval to fund relevant research and development efforts, as part of a EUR3.3 billion ($4.1 billion) deal to accelerate the development of 450-millimeter wafer technology and extreme ultra-violet lithography by as much as two years. In July 2013, Intel confirmed the acquisition of Omek Interactive, an Israeli company that makes technology for gesture-based interfaces, without disclosing the monetary value of the deal. An official statement from Intel read: "The acquisition of Omek Interactive will help increase Intel's capabilities in the delivery of more immersive perceptual computing experiences." One report estimated the value of the acquisition between US$30 million and $50 million. The acquisition of a Spanish natural language recognition startup, Indisys was announced in September 2013. The terms of the deal were not disclosed but an email from an Intel representative stated: "Intel has acquired Indisys, a privately held company based in Seville, Spain. The majority of Indisys employees joined Intel. We signed the agreement to acquire the company on May 31 and the deal has been completed." Indysis explains that its artificial intelligence (AI) technology "is a human image, which converses fluently and with common sense in multiple languages and also works in different platforms." In December 2014, Intel bought PasswordBox. In January 2015, Intel purchased a 30% stake in Vuzix, a smart glasses manufacturer. The deal was worth $24.8 million. In February 2015, Intel announced its agreement to purchase German network chipmaker Lantiq, to aid in its expansion of its range of chips in devices with Internet connection capability. In June 2015, Intel announced its agreement to purchase FPGA design company Altera for $16.7 billion, in its largest acquisition to date. The acquisition completed in December 2015. In October 2015, Intel bought cognitive computing company Saffron Technology for an undisclosed price. In August 2016, Intel purchased deep-learning startup Nervana Systems for $350 million. In December 2016, Intel acquired computer vision startup Movidius for an undisclosed price. In March 2017, Intel announced that they had agreed to purchase Mobileye, an Israeli developer of "autonomous driving" systems for US$15.3 billion. In June 2017, Intel Corporation announced an investment of over Rs.1100 crore ($170 million) for its upcoming Research and Development (R&D) centre in Bangalore. In January 2019, Intel announced an investment of over $11 billion on a new Israeli chip plant, as told by the Israeli Finance Minister. 21 April 5, 2016 Yogitech IoT security and Advanced Driver Assistance Systems. In 2008, Intel spun off key assets of a solar startup business effort to form an independent company, SpectraWatt Inc. In 2011, SpectraWatt filed for bankruptcy. In February 2011, Intel began to build a new microprocessor manufacturing facility in Chandler, Arizona, completed in 2013 at a cost of $5 billion. The building was never used. The company produces three-quarters of its products in the United States, although three-quarters of its revenue come from overseas. In April 2011, Intel began a pilot project with ZTE Corporation to produce smartphones using the Intel Atom processor for China's domestic market. In December 2011, Intel announced that it reorganized several of its business units into a new mobile and communications group that would be responsible for the company's smartphone, tablet, and wireless efforts. Finding itself with excess fab capacity after the failure of the Ultrabook to gain market traction and with PC sales declining, in 2013 Intel reached a foundry agreement to produce chips for Altera using 14-nm process. General Manager of Intel's custom foundry division Sunit Rikhi indicated that Intel would pursue further such deals in the future. This was after poor sales of Windows 8 hardware caused a major retrenchment for most of the major semiconductor manufacturers, except for Qualcomm, which continued to see healthy purchases from its largest customer, Apple. As of July 2013, five companies were using Intel's fabs via the Intel Custom Foundry division: Achronix, Tabula, Netronome, Microsemi, and Panasonic – most are field-programmable gate array (FPGA) makers, but Netronome designs network processors. Only Achronix began shipping chips made by Intel using the 22-nm Tri-Gate process. Several other customers also exist but were not announced at the time. The Alliance for Affordable Internet (A4AI) was launched in October 2013 and Intel is part of the coalition of public and private organisations that also includes Facebook, Google, and Microsoft. Led by Sir Tim Berners-Lee, the A4AI seeks to make Internet access more affordable so that access is broadened in the developing world, where only 31% of people are online. Google will help to decrease Internet access prices so that they fall below the UN Broadband Commission's worldwide target of 5% of monthly income. In October 2018, Arm Holdings partnered with Intel in order to share code for embedded systems through the Yocto Project. In 1983, at the dawn of the personal computer era, Intel's profits came under increased pressure from Japanese memory-chip manufacturers, and then-president Andy Grove focused the company on microprocessors. Grove described this transition in the book Only the Paranoid Survive. A key element of his plan was the notion, then considered radical, of becoming the single source for successors to the popular 8086 microprocessor. Until then, the manufacture of complex integrated circuits was not reliable enough for customers to depend on a single supplier, but Grove began producing processors in three geographically distinct factories,[which?] and ceased licensing the chip designs to competitors such as Zilog and AMD. When the PC industry boomed in the late 1980s and 1990s, Intel was one of the primary beneficiaries. Despite the ultimate importance of the microprocessor, the 4004 and its successors the 8008 and the 8080 were never major revenue contributors at Intel. As the next processor, the 8086 (and its variant the 8088) was completed in 1978, Intel embarked on a major marketing and sales campaign for that chip nicknamed "Operation Crush", and intended to win as many customers for the processor as possible. One design win was the newly created IBM PC division, though the importance of this was not fully realized at the time. IBM introduced its personal computer in 1981, and it was rapidly successful. In 1982, Intel created the 80286 microprocessor, which, two years later, was used in the IBM PC/AT. Compaq, the first IBM PC "clone" manufacturer, produced a desktop system based on the faster 80286 processor in 1985 and in 1986 quickly followed with the first 80386-based system, beating IBM and establishing a competitive market for PC-compatible systems and setting up Intel as a key component supplier. In 1975, the company had started a project to develop a highly advanced 32-bit microprocessor, finally released in 1981 as the Intel iAPX 432. The project was too ambitious and the processor was never able to meet its performance objectives, and it failed in the marketplace. Intel extended the x86 architecture to 32 bits instead. During this period Andrew Grove dramatically redirected the company, closing much of its DRAM business and directing resources to the microprocessor business. Of perhaps greater importance was his decision to "single-source" the 386 microprocessor. Prior to this, microprocessor manufacturing was in its infancy, and manufacturing problems frequently reduced or stopped production, interrupting supplies to customers. To mitigate this risk, these customers typically insisted that multiple manufacturers produce chips they could use to ensure a consistent supply. The 8080 and 8086-series microprocessors were produced by several companies, notably AMD, with which Intel had a technology-sharing contract. Grove made the decision not to license the 386 design to other manufacturers, instead, producing it in three geographically distinct factories: Santa Clara, California; Hillsboro, Oregon; and Chandler, a suburb of Phoenix, Arizona. He convinced customers that this would ensure consistent delivery. In doing this, Intel breached its contract with AMD, which sued and was paid millions of dollars in damages but could not manufacture new Intel CPU designs any longer. (Instead, AMD started to develop and manufacture its own competing x86 designs.) As the success of Compaq's Deskpro 386 established the 386 as the dominant CPU choice, Intel achieved a position of near-exclusive dominance as its supplier. Profits from this funded rapid development of both higher-performance chip designs and higher-performance manufacturing capabilities, propelling Intel to a position of unquestioned leadership by the early 1990s. Intel introduced the 486 microprocessor in 1989, and in 1990 established a second design team, designing the processors code-named "P5" and "P6" in parallel and committing to a major new processor every two years, versus the four or more years such designs had previously taken. Engineers Vinod Dham and Rajeev Chandrasekhar (Member of Parliament, India) were key figures on the core team that invented the 486 chip and later, Intel's signature Pentium chip. The P5 project was earlier known as "Operation Bicycle," referring to the cycles of the processor through two parallel execution pipelines. The P5 was introduced in 1993 as the Intel Pentium, substituting a registered trademark name for the former part number (numbers, such as 486, cannot be legally registered as trademarks in the United States). The P6 followed in 1995 as the Pentium Pro and improved into the Pentium II in 1997. New architectures were developed alternately in Santa Clara, California and Hillsboro, Oregon. The Santa Clara design team embarked in 1993 on a successor to the x86 architecture, codenamed "P7". The first attempt was dropped a year later but quickly revived in a cooperative program with Hewlett-Packard engineers, though Intel soon took over primary design responsibility. The resulting implementation of the IA-64 64-bit architecture was the Itanium, finally introduced in June 2001. The Itanium's performance running legacy x86 code did not meet expectations, and it failed to compete effectively with x86-64, which was AMD's 64-bit extension of the 32-bit x86 architecture (Intel uses the name Intel 64, previously EM64T). In 2017, Intel announced that the Itanium 9700 series (Kittson) would be the last Itanium chips produced. The Hillsboro team designed the Willamette processors (initially code-named P68), which were marketed as the Pentium 4. In June 1994, Intel engineers discovered a flaw in the floating-point math subsection of the P5 Pentium microprocessor. Under certain data-dependent conditions, the low-order bits of the result of a floating-point division would be incorrect. The error could compound in subsequent calculations. Intel corrected the error in a future chip revision, and under public pressure it issued a total recall and replaced the defective Pentium CPUs (which were limited to some 60, 66, 75, 90, and 100 MHz models) on customer request. The bug was discovered independently in October 1994 by Thomas Nicely, Professor of Mathematics at Lynchburg College. He contacted Intel but received no response. On October 30, he posted a message about his finding on the Internet. Word of the bug spread quickly and reached the industry press. The bug was easy to replicate; a user could enter specific numbers into the calculator on the operating system. Consequently, many users did not accept Intel's statements that the error was minor and "not even an erratum." During Thanksgiving, in 1994, The New York Times ran a piece by journalist John Markoff spotlighting the error. Intel changed its position and offered to replace every chip, quickly putting in place a large end-user support organization. This resulted in a $475 million charge against Intel's 1994 revenue. Dr. Nicely later learned that Intel had discovered the FDIV bug in its own testing a few months before him (but had decided not to inform customers). The "Pentium flaw" incident, Intel's response to it, and the surrounding media coverage propelled Intel from being a technology supplier generally unknown to most computer users to a household name. Dovetailing with an uptick in the "Intel Inside" campaign, the episode is considered to have been a positive event for Intel, changing some of its business practices to be more end-user focused and generating substantial public awareness, while avoiding a lasting negative impression. During this period, Intel undertook two major supporting advertising campaigns. The first campaign, the 1991 "Intel Inside" marketing and branding campaign, is widely known and has become synonymous with Intel itself. The idea of "ingredient branding" was new at the time, with only NutraSweet and a few others making attempts to do so. This campaign established Intel, which had been a component supplier little-known outside the PC industry, as a household name. The second campaign, Intel's Systems Group, which began in the early 1990s, showcased manufacturing of PC motherboards, the main board component of a personal computer, and the one into which the processor (CPU) and memory (RAM) chips are plugged. The Systems Group campaign was lesser known than the Intel Inside campaign. Shortly after, Intel began manufacturing fully configured "white box" systems for the dozens of PC clone companies that rapidly sprang up. At its peak in the mid-1990s, Intel manufactured over 15% of all PCs, making it the third-largest supplier at the time. During the 1990s, Intel Architecture Labs (IAL) was responsible for many of the hardware innovations for the PC, including the PCI Bus, the PCI Express (PCIe) bus, and Universal Serial Bus (USB). IAL's software efforts met with a more mixed fate; its video and graphics software was important in the development of software digital video, but later its efforts were largely overshadowed by competition from Microsoft. The competition between Intel and Microsoft was revealed in testimony by then IAL Vice-President Steven McGeady at the Microsoft antitrust trial (United States v. Microsoft Corp.). In early January 2018, it was reported that all Intel processors made since 1995 (besides Intel Itanium and pre-2013 Intel Atom) have been subject to two security flaws dubbed Meltdown and Spectre. The impact on performance resulting from software patches is "workload-dependent". Several procedures to help protect home computers and related devices from the Spectre (and Meltdown) security vulnerabilities have been published. Spectre patches have been reported to significantly slow down performance, especially on older computers; on the newer 8th generation Core platforms, benchmark performance drops of 2–14 percent have been measured. Meltdown patches may also produce performance loss. It is believed that "hundreds of millions" of systems could be affected by these flaws. On March 15, 2018, Intel reported that it will redesign its CPU processors (performance losses to be determined) to protect against the Spectre security vulnerability, and expects to release the newly redesigned processors later in 2018. On May 3, 2018, eight additional Spectre-class flaws were reported. Intel reported that they are preparing new patches to mitigate these flaws. On August 14, 2018, Intel disclosed three additional chip flaws referred to as L1 Terminal Fault (L1TF). They reported that previously released microcode updates, along with new, pre-release microcode updates can be used to mitigate these flaws. Intel has decided to discontinue with their recent Intel Remote Keyboard Android app after encountering several security bugs. This app was launched in early 2015 to help users control Intel single-board computers and Intel NUC. The company has asked Remote Keyboard Users to delete the app at their first convenience. In 2008, Intel began shipping mainstream solid-state drives (SSDs) with up to 160 GB storage capacities. As with their CPUs, Intel develops SSD chips using ever-smaller nanometer processes. These SSDs make use of industry standards such as NAND flash, mSATA, PCIe, and NVMe. In 2017, Intel introduced SSDs based on 3D XPoint technology under the Optane brand name. The Intel Scientific Computers division was founded in 1984 by Justin Rattner, to design and produce parallel computers based on Intel microprocessors connected in hypercube internetwork topology. In 1992, the name was changed to the Intel Supercomputing Systems Division, and development of the iWarp architecture was also subsumed. The division designed several supercomputer systems, including the Intel iPSC/1, iPSC/2, iPSC/860, Paragon and ASCI Red. In November 2014, Intel revealed that it is going to use light beams to speed up supercomputers. In 2007 Intel formed the Moblin project to create an open source Linux operating system for x86-based mobile devices. Following the success of Google's Android platform which ran exclusively on ARM processors, Intel announced on February 15, 2010, that it would partner with Nokia and merge Moblin with Nokia's ARM-based Maemo project to create MeeGo. MeeGo was supported by the Linux Foundation. In February 2011 Nokia left the project after partnering with Microsoft, leaving Intel in sole charge of MeeGo. An Intel spokeswoman said it was "disappointed" by Nokia's decision but that Intel was committed to MeeGo. In September 2011 Intel stopped working on MeeGo and partnered with Samsung to create Tizen, a new project hosted by the Linux Foundation. Intel has since been co-developing the Tizen operating system which runs on several Samsung devices. Two factors combined to end this dominance: the slowing of PC demand growth beginning in 2000 and the rise of the low-cost PC. By the end of the 1990s, microprocessor performance had outstripped software demand for that CPU power. Aside from high-end server systems and software, whose demand dropped with the end of the "dot-com bubble", consumer systems ran effectively on increasingly low-cost systems after 2000. Intel's strategy of producing ever-more-powerful processors and obsoleting their predecessors stumbled, leaving an opportunity for rapid gains by competitors, notably AMD. This, in turn, lowered the profitability of the processor line and ended an era of unprecedented dominance of the PC hardware by Intel. A case of industrial espionage arose in 1995 that involved both Intel and AMD. Bill Gaede, an Argentine formerly employed both at AMD and at Intel's Arizona plant, was arrested for attempting in 1993 to sell the i486 and P5 Pentium designs to AMD and to certain foreign powers. Gaede videotaped data from his computer screen at Intel and mailed it to AMD, which immediately alerted Intel and authorities, resulting in Gaede's arrest. Gaede was convicted and sentenced to 33 months in prison in June 1996. On June 6, 2005, Steve Jobs, then CEO of Apple, announced that Apple would be transitioning from its long favored PowerPC architecture to the Intel x86 architecture because the future PowerPC road map was unable to satisfy Apple's needs. The first Macintosh computers containing Intel CPUs were announced on January 10, 2006, and Apple had its entire line of consumer Macs running on Intel processors by early August 2006. The Apple Xserve server was updated to Intel Xeon processors from November 2006 and was offered in a configuration similar to Apple's Mac Pro. In July 2007, the company released a print advertisement for its Intel Core 2 Duo processor featuring six African-American runners appearing to bow down to a Caucasian male inside of an office setting (due to the posture taken by runners on starting blocks). According to Nancy Bhagat, Vice President of Intel Corporate Marketing, viewers found the ad to be "insensitive and insulting", and several Intel executives made public apologies. The Classmate PC is the company's first low-cost netbook computer. In 2014, the company released an updated version of the Classmate PC. In June 2011, Intel introduced the first Pentium mobile processor based on the Sandy Bridge core. The B940, clocked at 2 GHz, is faster than existing or upcoming mobile Celerons, although it is almost identical to dual-core Celeron CPUs in all other aspects. According to IHS iSuppli's report on September 28, 2011, Sandy Bridge chips have helped Intel increase its market share in global processor market to 81.8%, while AMD's market share dropped to 10.4%. Intel planned to introduce Medfield – a processor for tablets and smartphones – to the market in 2012, as an effort to compete with ARM. As a 32-nanometer processor, Medfield is designed to be energy-efficient, which is one of the core features in ARM's chips. At the Intel Developers Forum (IDF) 2011 in San Francisco, Intel's partnership with Google was announced. By January 2012, Google's Android 2.3 will use Intel's Atom microprocessor. In July 2011, Intel announced that its server chips, the Xeon series, will use new sensors that can improve data center cooling efficiency. In 2011, Intel announced the Ivy Bridge processor family at the Intel Developer Forum. Ivy Bridge supports both DDR3 memory and DDR3L chips. As part of its efforts in the Positive Energy Buildings Consortium, Intel has been developing an application, called Personal Office Energy Monitor (POEM), to help office buildings to be more energy-efficient. With this application, employees can get the power consumption info for their office machines, so that they can figure out a better way to save energy in their working environment. Intel has introduced some simulation games, starting in 2009 with web-based IT Manager 3: Unseen Forces. In it, the player manages a company's IT department. The goal is to apply technology and skill to enable the company to grow from a small business into a global enterprise. [better source needed] The game has since been discontinued and succeeded in 2012 by the web-based multiplayer game IT Manager: Duels, which is no longer available. In 2011, Intel announced that it is working on a car security system that connects to smartphones via an application. The application works by streaming video to a cloud service if a car armed with the system is broken into. Intel also developed High-Bandwidth Digital Content Protection (HDCP) to prevent access of digital audio and video content as it travels across connections. In 2013, Intel's Kirk Skaugen said that Intel's exclusive focus on Microsoft platforms was a thing of the past and that they would now support all "tier-one operating systems" such as Linux, Android, iOS, and Chrome. In 2014, Intel cut thousands of employees in response to "evolving market trends", and offered to subsidize manufacturers for the extra costs involved in using Intel chips in their tablets. In June 2013, Intel unveiled its fourth generation of Intel Core processors (Haswell) in an event named Computex in Taipei. On January 6, 2014, Intel announced that it was "teaming with the Council of Fashion Designers of America, Barneys New York and Opening Ceremony around the wearable tech field." Intel developed a reference design for wearable smart earbuds that provide biometric and fitness information. The Intel smart earbuds provide full stereo audio, and monitor heart rate, while the applications on the user’s phone keep track of run distance and calories burned. CNBC reported that Intel eliminated the division that worked on health wearables in 2017. On November 19, 2015, Intel, alongside ARM Holdings, Dell, Cisco Systems, Microsoft, and Princeton University, founded the OpenFog Consortium, to promote interests and development in fog computing. Intel's Chief Strategist for the IoT Strategy and Technology Office, Jeff Faders, became the consortium's first president. In 2009, Intel announced that it planned to undertake an effort to remove conflict resources—materials sourced from mines whose profits are used to fund armed militant groups, particularly within the Democratic Republic of the Congo—from its supply chain. Intel sought conflict-free sources of the precious metals common to electronics from within the country, using a system of first- and third-party audits, as well as input from the Enough Project and other organizations. During a keynote address at Consumer Electronics Show 2014, Intel CEO at the time, Brian Krzanich, announced that the company's microprocessors would henceforth be conflict free. In 2016, Intel stated that it had expected its entire supply chain to be conflict-free by the end of the year. Intel is one of the biggest stakeholders in the self-driving car industry, having joined the race in mid 2017 after joining forces with Mobileye. The company is also one of the first in the sector to research consumer acceptance, after an AAA report quoted a 78% nonacceptance rate of the technology in the US. Safety levels of the technology, the thought of abandoning control to a machine, and psychological comfort of passengers in such situations were the major discussion topics initially. The commuters also stated that they did not want to see everything the car was doing. This was primarily a referral to the auto-steering wheel with no one sitting in the driving seat. Intel also learned that voice control regulator is vital, and the interface between the humans and machine eases the discomfort condition, and brings some sense of control back. It is important to mention that Intel included only 10 people in this study, which makes the study less credible. In a video posted on YouTube, Intel accepted this fact and called for further testing. Robert Noyce was Intel's CEO at its founding in 1968, followed by co-founder Gordon Moore in 1975. Andy Grove became the company's president in 1979 and added the CEO title in 1987 when Moore became chairman. In 1998, Grove succeeded Moore as Chairman, and Craig Barrett, already company president, took over. 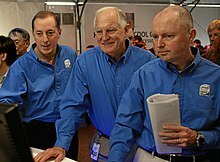 On May 18, 2005, Barrett handed the reins of the company over to Paul Otellini, who had been the company president and COO and who was responsible for Intel's design win in the original IBM PC. The board of directors elected Otellini as President and CEO, and Barrett replaced Grove as Chairman of the Board. Grove stepped down as chairman but is retained as a special adviser. In May 2009, Barrett stepped down as chairman of the Board and was succeeded by Jane Shaw. In May 2012, Intel vice chairman Andy Bryant, who had held the posts of CFO (1994) and Chief Administrative Officer (2007) at Intel, succeeded Shaw as executive chairman. In November 2012, president and CEO Paul Otellini announced that he would step down in May 2013 at the age of 62, three years before the company's mandatory retirement age. During a six-month transition period, Intel's board of directors commenced a search process for the next CEO, in which it considered both internal managers and external candidates such as Sanjay Jha and Patrick Gelsinger. Financial results revealed that, under Otellini, Intel's revenue increased by 55.8 percent (US$34.2 to 53.3 billion), while its net income increased by 46.7% (US$7.5 billion to 11 billion). On May 2, 2013, Executive Vice President and COO Brian Krzanich was elected as Intel's sixth CEO, a selection that became effective on May 16, 2013, at the company's annual meeting. Reportedly, the board concluded that an insider could proceed with the role and exert an impact more quickly, without the need to learn Intel's processes, and Krzanich was selected on such a basis. Intel's software head Renée James was selected as president of the company, a role that is second to the CEO position. As of May 2013, Intel's board of directors consists of Andy Bryant, John Donahoe, Frank Yeary, Ambassador Charlene Barshefsky, Susan Decker, Reed Hundt, Paul Otellini, James Plummer, David Pottruck, and David Yoffie and Creative director will.i.am. The board was described by former Financial Times journalist Tom Foremski as "an exemplary example of corporate governance of the highest order" and received a rating of ten from GovernanceMetrics International, a form of recognition that has only been awarded to twenty-one other corporate boards worldwide. On June 21, 2018, Intel announced the resignation of Brian Krzanich as CEO, with the exposure of a relationship he had with an employee. Bob Swan was named interim CEO, as the Board began a search for a permanent CEO. Intel microprocessor facility in Costa Rica was responsible in 2006 for 20% of Costa Rican exports and 4.9% of the country's GDP. The firm promotes very heavily from within, most notably in its executive suite. The company has resisted the trend toward outsider CEOs. Paul Otellini was a 30-year veteran of the company when he assumed the role of CEO. All of his top lieutenants have risen through the ranks after many years with the firm. In many cases, Intel's top executives have spent their entire working careers with Intel. Intel has a mandatory retirement policy for its CEOs when they reach age 65. 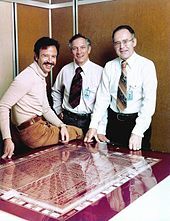 Andy Grove retired at 62, while both Robert Noyce and Gordon Moore retired at 58. Grove retired as Chairman and as a member of the board of directors in 2005 at age 68. Intel's headquarters are located in Santa Clara, California, and the company has operations around the world. Its largest workforce concentration anywhere is in Washington County, Oregon (in the Portland metropolitan area's "Silicon Forest"), with 18,600 employees at several facilities. Outside the United States, the company has facilities in China, Costa Rica, Malaysia, Israel, Ireland, India, Russia, Argentina and Vietnam, in 63 countries and regions internationally. In the U.S. Intel employs significant numbers of people in California, Colorado, Massachusetts, Arizona, New Mexico, Oregon, Texas, Washington and Utah. In Oregon, Intel is the state's largest private employer. The company is the largest industrial employer in New Mexico while in Arizona the company has over 10,000 employees. Intel invests heavily in research in China and about 100 researchers – or 10% of the total number of researchers from Intel – are located in Beijing. In 2011, the Israeli government offered Intel $290 million to expand in the country. As a condition, Intel would employ 1,500 more workers in Kiryat Gat and between 600–1000 workers in the north. In January 2014, it was reported that Intel would cut about 5,000 jobs from its work force of 107,000. The announcement was made a day after it reported earnings that missed analyst targets. In March 2014, it was reported that Intel would embark upon a $6 billion plan to expand its activities in Israel. The plan calls for continued investment in existing and new Intel plants until 2030. As of 2014 Intel employs 10,000 workers at four development centers and two production plants in Israel. Intel has a Diversity Initiative, including employee diversity groups as well as supplier diversity programs. Like many companies with employee diversity groups, they include groups based on race and nationality as well as sexual identity and religion. In 1994, Intel sanctioned one of the earliest corporate Gay, Lesbian, Bisexual, and Transgender employee groups, and supports a Muslim employees group, a Jewish employees group, and a Bible-based Christian group. Intel received a 100% rating on the first Corporate Equality Index released by the Human Rights Campaign in 2002. It has maintained this rating in 2003 and 2004. In addition, the company was named one of the 100 Best Companies for Working Mothers in 2005 by Working Mother magazine. In January 2015, Intel announced the investment of $300 million over the next five years to enhance gender and racial diversity in their own company as well as the technology industry as a whole. In February 2016, Intel released its Global Diversity & Inclusion 2015 Annual Report. The male-female mix of US employees was reported as 75.2% men and 24.8% women. For US employees in technical roles, the mix was reported as 79.8% male and 20.1% female. NPR reports that Intel is facing a retention problem (particularly for African Americans), not just a pipeline problem. In 2011, ECONorthwest conducted an economic impact analysis of Intel's economic contribution to the state of Oregon. The report found that in 2009 "the total economic impacts attributed to Intel's operations, capital spending, contributions and taxes amounted to almost $14.6 billion in activity, including $4.3 billion in personal income and 59,990 jobs". Through multiplier effects, every 10 Intel jobs supported, on average, was found to create 31 jobs in other sectors of the economy. In Rio Rancho, New Mexico, Intel is the leading employer. In 1997, a community partnership between Sandoval County and Intel Corporation funded and built Rio Rancho High School. In 2011, Intel Capital announced a new fund to support startups working on technologies in line with the company's concept for next generation notebooks. The company is setting aside a $300 million fund to be spent over the next three to four years in areas related to ultrabooks. Intel announced the ultrabook concept at Computex in 2011. The ultrabook is defined as a thin (less than 0.8 inches [~2 cm] thick) notebook that utilizes Intel processors and also incorporates tablet features such as a touch screen and long battery life. At the Intel Developers Forum in 2011, four Taiwan ODMs showed prototype ultrabooks that used Intel's Ivy Bridge chips. Intel plans to improve power consumption of its chips for ultrabooks, like new Ivy Bridge processors in 2013, which will only have 10W default thermal design power. Intel's goal for Ultrabook's price is below $1000; however, according to two presidents from Acer and Compaq, this goal will not be achieved if Intel does not lower the price of its chips. Intel has become one of the world's most recognizable computer brands following its long-running Intel Inside campaign. The idea for "Intel Inside" came out of a meeting between Intel and one of the major computer resellers, MicroAge. In the late 1980s, Intel's market share was being seriously eroded by upstart competitors such as Advanced Micro Devices (now AMD), Zilog, and others who had started to sell their less expensive microprocessors to computer manufacturers. This was because, by using cheaper processors, manufacturers could make cheaper computers and gain more market share in an increasingly price-sensitive market. In 1989, Intel's Dennis Carter visited MicroAge's headquarters in Tempe, Arizona, to meet with MicroAge's VP of Marketing, Ron Mion. MicroAge had become one of the largest distributors of Compaq, IBM, HP, and others and thus was a primary – although indirect – driver of demand for microprocessors. Intel wanted MicroAge to petition its computer suppliers to favor Intel chips. However, Mion felt that the marketplace should decide which processors they wanted. Intel's counterargument was that it would be too difficult to educate PC buyers on why Intel microprocessors were worth paying more for ... and they were right. But Mion felt that the public didn't really need to fully understand why Intel chips were better, they just needed to feel they were better. So Mion proposed a market test. Intel would pay for a MicroAge billboard somewhere saying, "If you're buying a personal computer, make sure it has Intel inside." In turn, MicroAge would put "Intel Inside" stickers on the Intel-based computers in their stores in that area. To make the test easier to monitor, Mion decided to do the test in Boulder, Colorado, where it had a single store. Virtually overnight, the sales of personal computers in that store dramatically shifted to Intel-based PCs. Intel very quickly adopted "Intel Inside" as its primary branding and rolled it out worldwide. As is often the case with computer lore, other tidbits have been combined to explain how things evolved. "Intel Inside" has not escaped that tendency and there are other "explanations" that had been floating around. Intel's branding campaign started with "The Computer Inside" tagline in 1990 in the US and Europe. The Japan chapter of Intel proposed an "Intel in it" tagline and kicked off the Japanese campaign by hosting EKI-KON (meaning "Station Concert" in Japanese) at the Tokyo railway station dome on Christmas Day, December 25, 1990. Several months later, "The Computer Inside" incorporated the Japan idea to become "Intel Inside" which eventually elevated to the worldwide branding campaign in 1991, by Intel marketing manager Dennis Carter. The case study of the Inside Intel Inside was put together by Harvard Business School. The five-note jingle was introduced in 1994 and by its tenth anniversary was being heard in 130 countries around the world. The initial branding agency for the "Intel Inside" campaign was DahlinSmithWhite Advertising of Salt Lake City. The Intel swirl logo was the work of DahlinSmithWhite art director Steve Grigg under the direction of Intel president and CEO Andy Grove. The Intel Inside advertising campaign sought public brand loyalty and awareness of Intel processors in consumer computers. Intel paid some of the advertiser's costs for an ad that used the Intel Inside logo and xylo-marimba jingle. In 2008, Intel planned to shift the emphasis of its Intel Inside campaign from traditional media such as television and print to newer media such as the Internet. Intel required that a minimum of 35% of the money it provided to the companies in its co-op program be used for online marketing. The Intel 2010 annual financial report indicated that $1.8 billion (6% of the gross margin and nearly 16% of the total net income) was allocated to all advertising with Intel Inside being part of that. The famous D♭ D♭ G♭ D♭ A♭ xylophone/xylomarimba jingle, sonic logo, tag, audio mnemonic was produced by Musikvergnuegen and written by Walter Werzowa, once a member of the Austrian 1980s sampling band Edelweiss. The sonic Intel logo was remade in 1999 to coincide with the launch of the Pentium III, and a second time in 2004 to coincide with the new logo change (although it overlapped with the 1999 version and was not mainstreamed until the launch of the Core processors in 2006), with the melody unchanged. Advertisements for products featuring Intel processors with prominent MMX branding featured a version of the jingle with an embellishment after the final note. In 2006, Intel expanded its promotion of open specification platforms beyond Centrino, to include the Viiv media center PC and the business desktop Intel vPro. In mid-January 2006, Intel announced that they were dropping the long running Pentium name from their processors. The Pentium name was first used to refer to the P5 core Intel processors and was done to comply with court rulings that prevent the trademarking of a string of numbers, so competitors could not just call their processor the same name, as had been done with the prior 386 and 486 processors (both of which had copies manufactured by IBM and AMD). They phased out the Pentium names from mobile processors first, when the new Yonah chips, branded Core Solo and Core Duo, were released. The desktop processors changed when the Core 2 line of processors were released. By 2009, Intel was using a good-better-best strategy with Celeron being good, Pentium better, and the Intel Core family representing the best the company has to offer. According to spokesman Bill Calder, Intel has maintained only the Celeron brand, the Atom brand for netbooks and the vPro lineup for businesses. Since late 2009, Intel's mainstream processors have been called Celeron, Pentium, Core i3, Core i5, and Core i7, in order of performance from lowest to highest. The first generation core products carry a 3 digit name, such as i5 750, and the second generation products carry a 4 digit name, such as the i5 2500. In both cases, a K at the end of it shows that it is an unlocked processor, enabling additional overclocking abilities (for instance, 2500K). vPro products will carry the Intel Core i7 vPro processor or the Intel Core i5 vPro processor name. In October 2011, Intel started to sell its Core i7-2700K "Sandy Bridge" chip to customers worldwide. Since 2010, "Centrino" is only being applied to Intel's WiMAX and Wi-Fi technologies. Neo Sans Intel is a customized version of Neo Sans based on the Neo Sans and Neo Tech, designed by Sebastian Lester in 2004. Intel Clear is a global font announced in 2014 designed for to be used across all communications. The font family was designed by Red Peek Branding and Daltan Maag Ltd. Initially available in Latin, Greek and Cyrillic scripts, it replaced Neo Sans Intel as the company's corporate typeface. Intel Clear Hebrew, Intel Clear Arabic were added by Daltan Maag Ltd. It is a book produced by Red Peak Branding as part of new brand identity campaign, celebrating Intel's achievements while setting the new standard for what Intel looks, feels and sounds like. Intel has a significant participation in the open source communities since 1999. [self-published source] For example, in 2006 Intel released MIT-licensed X.org drivers for their integrated graphic cards of the i965 family of chipsets. Intel released FreeBSD drivers for some networking cards, available under a BSD-compatible license, which were also ported to OpenBSD. Binary firmware files for non-wireless Ethernet devices were also released under a BSD licence allowing free redistribution. Intel ran the Moblin project until April 23, 2009, when they handed the project over to the Linux Foundation. Intel also runs the LessWatts.org campaigns. However, after the release of the wireless products called Intel Pro/Wireless 2100, 2200BG/2225BG/2915ABG and 3945ABG in 2005, Intel was criticized for not granting free redistribution rights for the firmware that must be included in the operating system for the wireless devices to operate. As a result of this, Intel became a target of campaigns to allow free operating systems to include binary firmware on terms acceptable to the open source community. Linspire-Linux creator Michael Robertson outlined the difficult position that Intel was in releasing to open source, as Intel did not want to upset their large customer Microsoft. Theo de Raadt of OpenBSD also claimed that Intel is being "an Open Source fraud" after an Intel employee presented a distorted view of the situation at an open-source conference. In spite of the significant negative attention Intel received as a result of the wireless dealings, the binary firmware still has not gained a license compatible with free software principles. Due to declining PC sales, in 2016 Intel cut 12,000 jobs. In October 2006, a Transmeta lawsuit was filed against Intel for patent infringement on computer architecture and power efficiency technologies. The lawsuit was settled in October 2007, with Intel agreeing to pay US$150 million initially and US$20 million per year for the next five years. Both companies agreed to drop lawsuits against each other, while Intel was granted a perpetual non-exclusive license to use current and future patented Transmeta technologies in its chips for 10 years. In September 2005, Intel filed a response to an AMD lawsuit, disputing AMD's claims, and claiming that Intel's business practices are fair and lawful. In a rebuttal, Intel deconstructed AMD's offensive strategy and argued that AMD struggled largely as a result of its own bad business decisions, including underinvestment in essential manufacturing capacity and excessive reliance on contracting out chip foundries. Legal analysts predicted the lawsuit would drag on for a number of years since Intel's initial response indicated its unwillingness to settle with AMD. In 2008 a court date was finally set, but in 2009, Intel settled with a $1.25 billion payout to AMD (see below). On November 4, 2009, New York's attorney general filed an antitrust lawsuit against Intel Corp, claiming the company used "illegal threats and collusion" to dominate the market for computer microprocessors. On November 12, 2009, AMD agreed to drop the antitrust lawsuit against Intel in exchange for $1.25 billion. A joint press release published by the two chip makers stated "While the relationship between the two companies has been difficult in the past, this agreement ends the legal disputes and enables the companies to focus all of our efforts on product innovation and development." An antitrust lawsuit and a class-action suit relating to cold calling employees of other companies has been settled. In 2005, the local Fair Trade Commission found that Intel violated the Japanese Antimonopoly Act. The commission ordered Intel to eliminate discounts that had discriminated against AMD. To avoid a trial, Intel agreed to comply with the order. In July 2007, the European Commission accused Intel of anti-competitive practices, mostly against AMD. The allegations, going back to 2003, include giving preferential prices to computer makers buying most or all of their chips from Intel, paying computer makers to delay or cancel the launch of products using AMD chips, and providing chips at below standard cost to governments and educational institutions. Intel responded that the allegations were unfounded and instead qualified its market behavior as consumer-friendly. General counsel Bruce Sewell responded that the Commission had misunderstood some factual assumptions as to pricing and manufacturing costs. In February 2008, Intel stated that its office in Munich had been raided by European Union regulators. Intel reported that it was cooperating with investigators. Intel faced a fine of up to 10% of its annual revenue, if found guilty of stifling competition. AMD subsequently launched a website promoting these allegations. In June 2008, the EU filed new charges against Intel. In May 2009, the EU found that Intel had engaged in anti-competitive practices and subsequently fined Intel €1.06 billion (US$1.44 billion), a record amount. Intel was found to have paid companies, including Acer, Dell, HP, Lenovo and NEC, to exclusively use Intel chips in their products, and therefore harmed other companies including AMD. The European Commission said that Intel had deliberately acted to keep competitors out of the computer chip market and in doing so had made a "serious and sustained violation of the EU's antitrust rules". In addition to the fine, Intel was ordered by the Commission to immediately cease all illegal practices. Intel has stated that they will appeal against the Commission's verdict. In June 2014, the General Court, which sits below the European Court of Justice, rejected the appeal. In September 2007, South Korean regulators accused Intel of breaking antitrust law. The investigation began in February 2006, when officials raided Intel's South Korean offices. The company risked a penalty of up to 3% of its annual sales, if found guilty. In June 2008, the Fair Trade Commission ordered Intel to pay a fine of US$25.5 million for taking advantage of its dominant position to offer incentives to major Korean PC manufacturers on the condition of not buying products from AMD. New York started an investigation of Intel in January 2008 on whether the company violated antitrust laws in pricing and sales of its microprocessors. In June 2008, the Federal Trade Commission also began an antitrust investigation of the case. In December 2009, the FTC announced it would initiate an administrative proceeding against Intel in September 2010. In November 2009, following a two-year investigation, New York Attorney General Andrew Cuomo sued Intel, accusing them of bribery and coercion, claiming that Intel bribed computer makers to buy more of their chips than those of their rivals, and threatened to withdraw these payments if the computer makers were perceived as working too closely with its competitors. Intel has denied these claims. On July 22, 2010, Dell agreed to a settlement with the U.S. Securities and Exchange Commission (SEC) to pay $100M in penalties resulting from charges that Dell did not accurately disclose accounting information to investors. In particular, the SEC charged that from 2002 to 2006, Dell had an agreement with Intel to receive rebates in exchange for not using chips manufactured by AMD. These substantial rebates were not disclosed to investors, but were used to help meet investor expectations regarding the company's financial performance; "These exclusivity payments grew from 10 percent of Dell's operating income in FY 2003 to 38 percent in FY 2006, and peaked at 76 percent in the first quarter of FY 2007." Dell eventually did adopt AMD as a secondary supplier in 2006, and Intel subsequently stopped their rebates, causing Dell's financial performance to fall. Intel has been accused by some residents of Rio Rancho, New Mexico of allowing VOCs to be released in excess of their pollution permit. One resident claimed that a release of 1.4 tons of carbon tetrachloride was measured from one acid scrubber during the fourth quarter of 2003 but an emission factor allowed Intel to report no carbon tetrachloride emissions for all of 2003. Another resident alleges that Intel was responsible for the release of other VOCs from their Rio Rancho site and that a necropsy of lung tissue from two deceased dogs in the area indicated trace amounts of toluene, hexane, ethylbenzene, and xylene isomers, all of which are solvents used in industrial settings but also commonly found in gasoline, retail paint thinners and retail solvents. During a sub-committee meeting of the New Mexico Environment Improvement Board, a resident claimed that Intel's own reports documented more than 1,580 pounds (720 kg) of VOCs were released in June and July 2006. Intel's environmental performance is published annually in their corporate responsibility report. In its 2012 rankings on the progress of consumer electronics companies relating to conflict minerals, the Enough Project rated Intel the best of 24 companies, calling it a "Pioneer of progress". In 2014, chief executive Brian Krzanich urged the rest of the industry to follow Intel's lead by also shunning conflict minerals. Intel has faced complaints of age discrimination in firing and layoffs. Intel was sued in 1993 by nine former employees, over allegations that they were laid off because they were over the age of 40. A group called FACE Intel (Former and Current Employees of Intel) claims that Intel weeds out older employees. FACE Intel claims that more than 90 percent of people who have been laid off or fired from Intel are over the age of 40. Upside magazine requested data from Intel breaking out its hiring and firing by age, but the company declined to provide any. Intel has denied that age plays any role in Intel's employment practices. FACE Intel was founded by Ken Hamidi, who was fired from Intel in 1995 at the age of 47. Hamidi was blocked in a 1999 court decision from using Intel's email system to distribute criticism of the company to employees, which overturned in 2003 in Intel Corp. v. Hamidi. In August 2016, Indian officials of the Bruhat Bengaluru Mahanagara Palike (BBMP) parked garbage trucks on Intel's campus and threatened to dump them for evading payment of property taxes between 2007 and 2008, to the tune of 340 million Indian rupees (4.9 million USD). Intel had reportedly been paying taxes as a non-air-conditioned office, when the campus in fact had central air conditioning. Other factors, such as land acquisition and construction improvements, added to the tax burden. Previously, Intel had appealed the demand in the Karnataka high court in July, during which the court ordered Intel to pay BBMP half the owed amount (170 million rupees, or 2.4 million USD) plus arrears by August 28 of that year. ^ a b c d e "Intel Corporation 2016 Annual Report Form (10-K)". EDGAR. United States Securities and Exchange Commission. February 27, 2016. Retrieved February 3, 2017. ^ "Earning Release Q3-2018" (PDF). October 25, 2018. ^ Vanian, Jonathan. "Samsung Dethrones Intel As World's Biggest Chip Maker". Fortune. ^ "Intel 2007 Annual Report" (PDF). Intel. 2007. Retrieved July 6, 2011. ^ "Secret of Intel's name revealed". The Inquirer. 2007. Retrieved June 11, 2012. ^ Goodin, Dan (September 23, 1998). "Microsoft's holy war on Java". CNET. Archived from the original on January 16, 2013. Retrieved November 18, 2018. ^ Graham, Lea (December 14, 1998). "USA versus Microsoft: the fourth week". BBC News. Retrieved January 7, 2008. ^ "What is 01.org? - 01.org". 01.org. ^ a b c d e f g "Document". www.sec.gov. ^ Dylan McGrath, EE Times. "IDC cuts PC microprocessor forecast." August 2, 2011. Retrieved August 2, 2011. ^ Agam Shah, IDG News. "IDC Reduces Yearly Processor Shipment Growth Forecast." August 1, 2011. Retrieved August 2, 2011. ^ Intel. "Intel Timeline: A History of Innovation". Intel. Retrieved 7 July 2017. ^ Fried, Ian (April 4, 2001). "Intel, AMD sign new licensing deal". CNet. Retrieved July 28, 2007. ^ "Patent Cross License Agreement – Advanced Micro Devices Inc. and Intel Corp". Findlaws, Inc. Archived from the original on June 21, 2007. Retrieved September 15, 2007. ^ Lohr, Steve (April 16, 2013). "Intel's Profit Falls 25% With Decline in Chip Sales". The New York Times. Retrieved April 17, 2013. ^ Morgan, Timothy (October 6, 2015). "Why Are We Still Waiting For ARM Servers?". ^ David B. Green (July 24, 2013). "This day in Jewish history / Intel co-founder and self-described Luddite is born". Haaretz. Retrieved September 5, 2013. ^ a b c d e "Intel Online Museum: Corporate Timeline (Archived version)". Intel Museum. Intel. Archived from the original on January 3, 2013. Retrieved July 23, 2011. ^ "Silicon Genesis: Arthur Rock". Stanford University. Retrieved July 23, 2011. ^ The Andrew Grove article explains how a clerical error exchanged the employee ID numbers of Grove and the fourth employee, Leslie L. Vadász, whom Grove had hired. ^ "IDF Transcript: Interview with Gordon Moore" (PDF). Intel Corporation. August 18, 2007. Retrieved July 29, 2009. ^ "Intel Timeline: A History of Innovation". Intel Corp.
^ "Intel Celebrates 30 Years of Innovation". Intel Corp. July 18, 1998. ^ "Defining Intel: 25 years / 25 events" (PDF). Intel Corp. p. 5. ^ "Two Found New Firm". San Jose Mercury News. August 6, 1968. Founders of Intel Corp. are Drs. Robert W. Noyce and Gordon Moore. ^ Valich, Theo (September 19, 2007). "Secret of Intel name revealed". The Inquirer. Archived from the original on June 29, 2012. Retrieved September 19, 2007. ^ 1969 – Schottky-Barrier Diode Doubles the Speed of TTL Memory & Logic Computer History Museum. Retrieved September 23, 2011. ^ Schottky Bipolar 3101, 3101A RAMs Google Docs. ^ Schottky Bipolar 3301A ROM Google Docs. ^ a b "A chronological list of Intel products. The products are sorted by date" (PDF). Intel museum. Intel Corporation. July 2005. Archived from the original (PDF) on August 9, 2007. Retrieved July 31, 2007. ^ Silicon Gate MOS 1101A RAM Google Docs. ^ Sideris, George (April 26, 1973). "The Intel 1103: The MOS memory that defied cores". Electronics. pp. 108–113. ^ Mary Bellis (August 25, 2016). "Who Invented the Intel 1103 DRAM Chip". ThoughtCo. ^ Silberhorn, Gottfried; Colin Douglas Howell. "Intel Intellec Series". old-computers.com. OLD-COMPUTERS.COM. Archived from the original on July 27, 2010. Retrieved July 31, 2007. ^ Wong, Nicole (July 31, 2006). "Intel Core 2 Duo a big leap in chip race". Seattle Times. Retrieved October 15, 2009. ^ The Senate Report on the bill (S.Rep. No. 425, 98th Cong., 2d Sess. (1984)) stated: "In the semiconductor industry, innovation is indispensable; research breakthroughs are essential to the life and health of the industry. But research and innovation in the design of semiconductor chips are threatened by the inadequacies of existing legal protection against piracy and unauthorized copying. This problem, which is so critical to this essential sector of the American economy, is addressed by the Semiconductor Chip Protection Act of 1984. ...[The bill] would prohibit "chip piracy"--the unauthorized copying and distribution of semiconductor chip products copied from the original creators of such works." Quoted in Brooktree Corp. v. Advanced Micro Devices, Inc., 977 F.2d 1555, 17 (Fed. Cir. 1992). See also Brooktree, 21–22 (copyright and patent law ineffective). ^ Krazit, Tom (July 14, 2006). "Intel's Core 2 Duo lives up to hype". ZDNet News. Archived from the original on April 30, 2009. Retrieved October 15, 2009. – citing CNET, Anandtech, Sharky's Extreme and PC Mag as publishing similar conclusions. ^ Sandhu, Tarinder (July 14, 2006). "Intel Core 2 Duo/Extreme processor review". Hexus technology news & reviews. Retrieved October 15, 2009. ^ Schofield, Jack (July 27, 2006). "Intel raises the bar as AMD drops prices in chip battle". The Guardian. UK. Retrieved October 15, 2009. ^ Nelson, Carl. "Intel Core i7 "Nehalem" CPU Review". www.hardcoreware.net. Archived from the original on December 18, 2013. Retrieved December 9, 2013. ^ "Marvell buys Intel's handheld processor unit for $600 million". eetimes.com. CMP Media LLC. June 27, 2006. Retrieved July 12, 2007. ^ "Intel in $7.68bn McAfee takeover". BBC News. August 19, 2010. Retrieved August 19, 2010. ^ "Intel wins conditional approval from EU for McAfee acquisition of $ 7.68 billion". TechShrimp. January 26, 2011. Archived from the original on January 29, 2011. Retrieved January 26, 2011. ^ By Dana Mattioli, Matt Jarzemsky and Don Clark, The Wall Street Journal. “Intel Agrees to Sell Majority Stake in Security Unit to TPG.” September 7, 2016. Retrieved September 9, 2016. ^ Dean Takahashi, VentureBeat. "Intel buys 4G wireless software firm SySDSoft." March 14, 2011. Retrieved March 17, 2011. ^ a b Dylan McGrath, EE Times. "Fulcrum buy could signal shift for Intel." July 19, 2011. Retrieved July 20, 2011. ^ . The New York Times. Retrieved October 2, 2011. ^ King, Ian (July 11, 2012). "Intel Investing $4.1 Billion in ASML to Speed Production". Bloomberg. ^ a b Ingrid Lunden (July 16, 2013). "Gesture In The Picture, As Intel Picks Up Omek But PrimeSense Dismisses Apple Acquisition Rumors". TechCrunch. AOL Inc. Retrieved September 14, 2013. ^ a b Ingrid Lunden (September 13, 2013). "Intel Has Acquired Natural Language Processing Startup Indisys, Price "North" Of $26M, To Build Its AI Muscle". TechCrunch. AOL Inc. Retrieved September 14, 2013. ^ "Intel acquires identity management service PasswordBox". The Next Web. Retrieved December 1, 2014. ^ "Intel buys $25 million stake in Google Glass rival Vuzix". The Verge. Retrieved January 6, 2014. ^ "Intel buys former Infineon "Internet of Things" chip unit Lantiq". Reuters. February 2, 2015. Retrieved February 2, 2015. ^ Burt, Jeffrey (December 28, 2015). "Intel Completes $16.7 Billion Altera Deal". eWeek. Retrieved December 29, 2015. ^ a b "Intel buys Saffron AI because it can't afford to miss the next big thing in tech again". Fortune. 26 October 2015. Retrieved 28 January 2015. ^ Fried, Ina. "Intel is paying at least $350 million to buy deep-learning startup Nervana Systems". Retrieved 9 August 2016. ^ a b Clark, Don; Jamerson, Joshua (September 6, 2016). "Intel to Buy Semiconductor Startup Movidius" – via www.wsj.com. ^ "Intel buys driverless car technology firm Mobileye". BBC. 13 March 2017. Retrieved 13 March 2017. ^ Hindu StanTimes. "Intel Corporation investing Rs 1,100 crore in India afresh." June 14, 2017. Retrieved June 26, 2017. ^ "Intel to invest $11 billion on new Israeli chip plant: Israel..." Reuters. 2019-01-29. Retrieved 2019-01-29. ^ "Intel to Acquire Wind River Systems for Approximately $884 Million". windriver.com. June 4, 2009. Retrieved December 9, 2013. ^ "Announcement | McAfee, Inc". Mcafee.com. February 28, 2011. Retrieved June 14, 2013. ^ Peter Ha (August 30, 2010). "Intel acquires Infineon's Wireless Solutions Business for $1.4 billion". TechCrunch. Retrieved June 14, 2013. ^ Rue Liu (March 17, 2011). "Intel Acquires Silicon Hive In Push For Mobile Processing Chips". SlashGear. Retrieved January 21, 2014. ^ Intel to acquire Telmap, dole out easy to implement location APIs to AppUp developers. Engadget.com. Retrieved on December 9, 2013. ^ "Source: Intel in talks to buy Israel's InVision Biometrics". Globes. October 30, 2011. Retrieved February 7, 2019. ^ "Source: Mashery Is Selling To Intel For More Than $180M". TechCrunch. April 17, 2013. Retrieved June 14, 2013. ^ "Intel's McAfee Is Buying Stonesoft, A Finnish Networked Firewall Specialist, For $389M In Cash". TechCrunch. May 6, 2013. Retrieved June 14, 2013. ^ IntelPR. "Intel Completes Acquisition of BASIS Science Inc". Intel Newsroom. ^ Ian King (August 14, 2014). "Intel to Buy Avago's Networking Business for $650 Million". Bloomberg.com. ^ "Intel Buys PasswordBox To Add ID Management To Its Security Business". TechCrunch. AOL. ^ "Intel buys $25 million stake in Google Glass rival Vuzix". The Verge. Vox Media. ^ "Intel buys former Infineon 'Internet of Things' chip unit Lantiq". Reuters. February 2, 2015. Retrieved June 29, 2015. ^ "Intel Acquires Recon". Retrieved January 13, 2016. ^ "Intel Acquires Ascending Technologies". January 4, 2016. Retrieved March 9, 2016. ^ "Intel buys Israeli 3D video tech firm Replay Technologies". Reuters. 2016-03-09. Retrieved 2016-03-10. ^ "Intel buys Yogitech, aims to bolster IoT safety efforts". ZDNet. 2016-04-05. Retrieved 2016-04-05. ^ "Intel buys deep learning startup Nervana Systems for a reported $350 million". TechCrunch. 2016-08-09. Retrieved 2016-08-09. ^ "Intel Completes Tender Offer for Mobileye". Intel Newsroom. Retrieved 2019-04-19. ^ "Intel buys Mobileye in $15.3B deal, moves its automotive unit to Israel". TechCrunch. Retrieved 2019-04-19. ^ "Intel Acquires Omnitek, Strengthens FPGA Video and Vision Offering". Omnitek. 2019-04-16. Retrieved 2019-04-19. ^ Cutress, Ian. "Intel Acquires Omnitek: FPGA Video Acceleration and Inferencing". www.anandtech.com. Retrieved 2019-04-19. ^ EE Times. "Intel's solar spinoff files for bankruptcy." August 23, 2011. Retrieved August 25, 2011. ^ Intel to Invest More Than $5 billion to Build New Factory in Arizona. Business Wire (February 18, 2011). Retrieved on July 8, 2011. ^ King, Ian. (February 18, 2011) "Intel Plans to Build $5 billion Chip Plant in Arizona". Bloomberg. Retrieved on July 8, 2011. ^ Sylvie Barak, EE Times. "Intel announces mobile and wirelss reorganization." December 14, 2011. Retrieved December 14, 2011. ^ "Intel throws open chip ovens to Altera – but who's next: Apple?". ^ "Intel and pals shrink their semis by $600m as demand droops • The Channel". ^ Intel to make 22-nm chips for Microsemi // EETimes, February 5, 2013: "Microsemi...becomes Intel's fifth publicly disclosed foundry customer, joining network processor provider Netronome and FPGA vendors Altera, Achronix and Tabula. " ^ Microsemi Emerges As Another Intel Manufacturing Customer // WSJ, May 1, 2013: " Paul Otellini ... also reiterated that Intel has other foundry customers it has not announced." ^ Samuel Gibbs (October 7, 2013). "Sir Tim Berners-Lee and Google lead coalition for cheaper Internet". The Guardian. Retrieved October 8, 2013. ^ "Arm cozies up to Intel for second time in a week – this time to borrow tools from Yocto Project for Mbed Linux". ^ Maliniak, Lisa (October 21, 2002). "Ten Notable Flops: Learning From Mistakes". Electronic Design Online. Archived from the original on December 16, 2008. Retrieved November 27, 2007. ^ Dvorak, John C. (February 1997). "What Ever Happened to... Intel's Dream Chip?". Retrieved November 27, 2007. ^ Davis, Lisa M. (2017-05-11). "The Evolution of Mission Critical Computing". Intel. Retrieved 2017-05-11. ...the 9700 series will be the last Intel Itanium processor. ^ "Intel's Itanium, once destined to replace x86 processors in PCs, hits end of line". PCWorld. Retrieved 15 May 2017. ^ Nicely, Dr. Thomas R. (October 30, 1994). "Dr. Thomas Nicely's Pentium email". Vince Emery Productions. Retrieved July 12, 2007. ^ Nicely, Thomas. "Personal website of Dr. Nicely, who discovered the bug". Retrieved April 6, 2016. ^ Nicely, Thomas. ""Pentium FDIV flaw" FAQ email from Dr. Nicely". Retrieved May 4, 2017. ^ Richard S. Tedlow (2007). Andy Grove: The Life and Times of an American Business Icon. p. 256. ISBN 978-1-59184-182-1. ^ Wilson, Tracy V. "HowStuffWorks "How Motherboards Work"". Computer.howstuffworks.com. Retrieved July 29, 2010. ^ Bogle, Ariel (January 4, 2018). "Processor vulnerabilities could leave most computers open to hackers". Retrieved January 4, 2018. ^ a b Murphy, Margi (January 3, 2018). "Fix for critical Intel chip flaw will slow down millions of computers". The Telegraph. Telegraph Media Group. Retrieved January 3, 2017. (Subscription required (help)). ^ Coldewey, Devin. "Kernel panic! What are Meltdown and Spectre, the bugs affecting nearly every computer and device?". Retrieved January 4, 2018. ^ "A Critical Intel Flaw Breaks Basic Security for Most Computers". Wired. Retrieved January 4, 2018. ^ Metz, Cade; Chen, Brian X. (January 4, 2018). "What You Need to Do Because of Flaws in Computer Chips". The New York Times. Retrieved 2018-01-05. ^ Pressman, Aaron (January 5, 2018). "Why Your Web Browser May Be Most Vulnerable to Spectre and What to Do About It". Fortune. Retrieved 2018-01-05. ^ Chacos, Brad (January 4, 2018). "How to protect your PC from the major Meltdown and Spectre CPU flaws". PC World. Archived from the original on 2018-01-04. Retrieved 2018-01-04. ^ Elliot, Matt (January 4, 2018). "Security – How to protect your PC against the Intel chip flaw – Here are the steps to take to keep your Windows laptop or PC safe from Meltdown and Spectre". CNET. Archived from the original on 2018-01-04. Retrieved 2018-01-04. ^ Hachman, Mark (January 9, 2018). "Microsoft tests show Spectre patches drag down performance on older PCs". PC World. Retrieved 2018-01-09. ^ Metz, Cade; Perlroth, Nicole (January 3, 2018). "Researchers Discover Two Major Flaws in the World's Computers". The New York Times. ISSN 0362-4331. Archived from the original on 2018-01-03. Retrieved 2018-01-03. ^ "Computer chip scare: What you need to know". BBC News. January 4, 2018. Retrieved 2018-01-04. ^ "Intel says processor bug isn't unique to its chips and performance issues are 'workload-dependent'". The Verge. Retrieved 2018-01-04. ^ "Meltdown and Spectre". meltdownattack.com. Retrieved January 4, 2018. ^ Warren, Tom (March 15, 2018). "Intel processors are being redesigned to protect against Spectre - New hardware coming later this year". The Verge. Retrieved March 15, 2018. ^ Shankland, Stephen (March 15, 2018). "Intel will block Spectre attacks with new chips this year - Cascade Lake processors for servers, coming this year, will fight back against a new class of vulnerabilities, says CEO Brian Krzanich". CNET. Retrieved March 15, 2018. ^ Tung, Liam. "Are 8 new 'Spectre-class' flaws about to be exposed? Intel confirms it's readying fixes | ZDNet". ZDNet. Retrieved 4 May 2018. ^ "Intel discloses three more chip flaws". Reuters. ^ Culbertson, Leslie. "Protecting Our Customers through the Lifecycle of Security Threats". Intel Newsroom. Retrieved 16 August 2018. ^ "Intel Tells Users to Uninstall Remote Keyboard App Over Unpatched Security Bugs". BleepingComputer. Retrieved 2018-04-05. ^ Intel Introduces Solid-State Drives for Notebook and Desktop Computers. Intel (September 8, 2008). Retrieved on July 8, 2011. ^ Intel, Micron Introduce 25-Nanometer NAND – The Smallest, Most Advanced Process Technology in the Semiconductor Industry. Intel (February 1, 2010). Retrieved on July 8, 2011. ^ Intel's SSD 310: G2 Performance in an mSATA Form Factor. AnandTech. Retrieved on July 8, 2011. ^ Tallis, Billy. "The Intel Optane SSD 900P 280GB Review". Anandtech. Retrieved 4 January 2018. ^ Wilson, Gregory (1994). "The History of the Development of Parallel Computing". Retrieved November 11, 2010. ^ "iWarp Project". Carnegie Mellon University. Retrieved November 11, 2010. ^ "Intel joins Nokia in Android attack". ^ "MeeGo: Nokia and Intel merge Maemo and Moblin". ^ "Intel defends MeeGo after Nokia defection". ^ "MeeGo is dead: Resurrected as Tizen, the newest Linux-based open source OS". ^ McCausland, Richard (May 24, 1993). "Counterpunch: Amx86 buyers get 'legal aid.' – Advanced Micro Devices offers legal aid to manufactures of Amx86-based machines warned by Intel Corp. to take out patent licenses". FindArticles. LookSmart Ltd. Archived from the original on October 1, 2009. Retrieved July 12, 2007. ^ "Worker Pleads Not Guilty in Intel Spy Case". The New York Times. October 20, 1995. Retrieved July 12, 2007. ^ "Ex-Intel Engineer Sentenced to Prison Term". The New York Times. June 25, 1996. Retrieved July 12, 2007. ^ "Ex-Intel employee pleads guilty – Guillermo Gaede pleads guilty to stealing Intel trade secrets – Industry Legal Issue". findarticles.com. LookSmart, Ltd. March 25, 1996. Archived from the original on October 1, 2009. Retrieved July 12, 2007. ^ Fried, Ina (January 12, 2006). "Jobs: New Intel Macs are 'screamers'". CNet. ^ Frucci, Adam (August 2, 2007). "Intel Apologizes for "Insulting" Sprinter Ad". Gizmodo. ^ Lemon, Sumner. "Intel's Classmate PC Enrolls". PC World. Retrieved October 21, 2011. ^ Gilbert, Ben (January 22, 2014). "Intel's latest education-focused tablet and Classmate PC reference designs add... more rubber?". Endagadget. ^ CPU World. "Intel mobile CPUs to launch in June 2011." CPU World. June 16, 2011. Retrieved June 20, 2011. ^ Jeffrey Burt, eWeek. "Intel Gains Chip Market Share Due to Sandy Bridge: IHS iSuppli." September 28, 2011. Retrieved October 7, 2011. ^ Brooke Crothers, CNET. "Intel maps out tablet plans through 2014." June 30, 2011. Retrieved July 1, 2011. ^ Agam Shah, IDG News. "Intel's New Smartphone Chip Is Key ARM Battle." June 7, 2011. Retrieved July 8, 2011. ^ WILL KNIGHT, Technology Review. "Intel Chases a More Power-Efficient Future." September 15, 2011. Retrieved September 19, 2011. ^ Chris Nuttall, Financial Times. "Intel and Google form Android chip alliance." September 13, 2011. Retrieved September 19, 2011. ^ All Geek. "Intel to Officially Support Android 2.3 Gingerbread by January 2012." September 12, 2011. Retrieved September 19, 2011. ^ James Niccolai, IDG News. "Intel Adds Sensors to Aid Data Center Cooling." PC World. July 8, 2011. Retrieved July 8, 2011. ^ Rick Merritt, EE Times. "Intel describes 22nm Ivy Bridge CPUs." September 13, 2011. Retrieved September 14, 2011. ^ Peter Sayer, IDG News. "Intel Hopes POEM Will Encourage Office Staff to Save Energy." PC World. July 8, 2011. Retrieved July 8, 2011. ^ "Intel technologies game: IT Manager 3: Unseen Forces - Intel® Software". software.intel.com. ^ Radu Tyrsina, Mobile Mag. "Intel working on streaming video car alarm systems Archived August 29, 2011, at the Wayback Machine." August 2, 2011. Retrieved August 2, 2011. ^ Clark, Jack (November 22, 2013). "Chipzilla couldn't keep up with ARM-dominated mobe world". channelregister.co.uk. The Register. Retrieved December 3, 2013. ^ Hargreaves, Steve (January 17, 2014). "Intel to cut over 5,000 jobs". cnn.com. CNNMoney. Retrieved January 17, 2014. ^ "How Intel is buying a piece of the tablet market". www.pcworld.com. PCWorld. January 17, 2014. Retrieved January 17, 2014. ^ Aditya Dey. "Intel Released 4th Generation Intel Core Processors in Taipei". TechStake-Technology News Blog. Archived from the original on 2016-01-01. ^ Karimzadeh, Marc (January 7, 2014). "Intel Making Fashion Push Into Wearable Technology". WWD. Retrieved January 13, 2014. ^ Farr, Christina (19 July 2017). "Intel axed its entire smartwatch and fitness-tracker group to focus on augmented reality, sources say". CNBC. Retrieved 4 January 2018. ^ Janakiram, MSV (18 April 2016). "Is Fog Computing the Next Big Thing in the Internet of Things". Forbes Magazine. Retrieved 18 April 2016. ^ "About Us - OpenFog Consortium". www.openfogconsortium.org. ^ Gunther, Marc (2014-01-13). "Intel unveils conflict-free processors: will the industry follow suit?". The Guardian. ISSN 0261-3077. Retrieved 2017-11-06. ^ "In 2016, Intel's Entire Supply Chain Will Be Conflict-Free". Fast Company. 2016-01-05. Retrieved 2017-11-06. ^ "Starting Now, All Intel Microprocessors Are Conflict-Free: Here's How The Company Did It". Fast Company. 2014-01-06. Retrieved 2017-11-06. ^ Balakrishnan, Anita (August 9, 2017). "Intel has joined the self-driving car race". CNBC. ^ "The Next Era of Driving is Here". Intel. ^ a b Baldwin, Roberto (24 August 2017). "Intel studies how to make people accept self-driving cars". ^ Ahmad, Taseer (29 August 2017). "Intel Studies the Self-Driving Car: Tackling the Question of Consumer Acceptance". LinkedIn Pulse. Archived from the original on 2 November 2017. ^ "Trust and Autonomous Driving". Youtube. ^ "Intel Announces Management Changes" (Press release). Intel. January 20, 2012. Retrieved December 25, 2012. ^ Terrence O'Brien (November 19, 2012). "Intel CEO Paul Otellini to step down in May, leaves a legacy of x86 dominance". Engadget. AOL Inc. Retrieved May 16, 2013. ^ Peter Kastner (May 6, 2013). "On the Impact of Paul Otellini's CEO Years at Intel". Tech.pinions. Tech.pinions. Retrieved May 16, 2013. ^ ALEXIS C. MADRIGAL (May 16, 2013). "Paul Otellini's Intel: Can the Company That Built the Future Survive It?". The Atlantic Monthly. The Atlantic Media Group. Retrieved May 16, 2013. ^ "Intel Board Elects Brian Krzanich as CEO" (Press release). Intel. Retrieved May 4, 2013. ^ DON CLARK; JOANN S. LUBLIN (May 2, 2013). "Intel's CEO Pick Is Predictable, but Not Its No. 2". The Wall Street Journal. Retrieved May 16, 2013. ^ Tom Foremski (May 1, 2013). "Meet Intel's King Makers – A Truly Exemplary Board Of Directors". Silicon Valley Watcher. Tom Foremski. Retrieved May 16, 2013. ^ "Robert (Bob) Swan's Email to Intel Employees, Customers and Partners on First Day as CEO". Intel Newsroom. Retrieved 2019-01-31. ^ "Intel Corporation (INTC) Ownership Summary". NASDAQ.com. ^ "Intel supone el 4,9 por ciento del PIB de Costa Rica" (in Spanish). El Economista. October 6, 2006. Retrieved April 13, 2008. ^ Rogoway, Mike (October 24, 2012). "Intel makes a bet on the future, and Oregon, with massive Hillsboro expansion". The Oregonian. Portland, Oregon. Retrieved August 9, 2015. ^ a b Rogoway, Mike (August 8, 2015). "Intel layoffs: Employees say chipmaker changed the rules, undermining 'meritocracy'". The Oregonian. Retrieved August 9, 2015. ^ Suh, Elizabeth (October 28, 2007). Home of Oregon's largest employer and much more. The Oregonian. ^ Mads Ølholm, semiaccurate. "Intel: Chinese microprocessor development inefficient." June 13, 2011. Retrieved June 20, 2011. ^ Peter Clarke, EE Times. "Israel offers Intel $290 million for expansion." July 27, 2011. Retrieved July 27, 2011. ^ "Intel to cut more than 5,000 employees". Venture Beat. January 18, 2014. ^ IsraelBizReg – Israel Company Profiles. "Intel to invest $6 billion in Israel in unprecedented deal." May 8, 2014. Retrieved September 11, 2014. ^ "Jobs at Intel – Diversity". Intel Corporation. Retrieved July 28, 2007. ^ Intel Gay, Lesbian, Bisexual or Transgender Employees Home Page. Intelglbt.org (July 16, 2008). Retrieved on July 8, 2011. ^ "Jobs at Intel – Diversity, Employee Groups (Intel Muslim Employee Group)". Intel Corporation. Archived from the original on June 24, 2006. Retrieved July 28, 2007. ^ "Jobs at Intel – Diversity, Employee Groups (Intel Jewish Community)". Intel Corporation. Archived from the original on February 2, 2008. Retrieved July 28, 2007. ^ "Jobs at Intel – Diversity, Employee Groups (Intel Bible-Based Christian Network)". Intel Corporation. Archived from the original on March 11, 2007. Retrieved July 28, 2007. ^ Intel Bible-Based Christian Network (IBCN) website. IBCN (April 8, 2011). Retrieved on July 8, 2011. ^ a b "Intel Diversity Report 2015". Intel Corporation. Retrieved February 5, 2016. ^ "Intel Discloses Diversity Data, Challenges Industry to Follow Suit". National Public Radio. Retrieved February 5, 2016. ^ "Wireless company dumps Rio Rancho". USA Today. August 18, 2004. Retrieved February 28, 2009. ^ "RIO RANCHO school district". Riorancho.com. Retrieved July 29, 2010. ^ "Intel in Your Community – New Mexico – News Room". Intel Corporation. Archived from the original on February 28, 2009. Retrieved July 29, 2010. ^ a b c Rick Merritt, EE Times. "Intel Capital launches $300M ultrabook fund." August 10, 2011. Retrieved August 11, 2011. ^ a b c d Jeffrey Burt, eWeek. "Intel Ultrabook Partners Look for Cut in Chip Prices: Report." September 20, 2011. Retrieved September 28, 2011. ^ Rick Merritt, EE Times. "Intel shows progress on ultrabook vision." September 14, 2011. Retrieved September 14, 2011. ^ Shilov, Anton. "Intel Readies "Ivy Bridge" Processors with 7W – 13W Power Consumption". X-bit labs. Archived from the original on February 14, 2013. Retrieved February 19, 2013. ^ Aaron Lee & Joseph Tsai, DIGITIMES. "Intel downstream partners request CPU price drop." September 20, 2011. Retrieved September 28, 2011. ^ "Intel Inside Program: Anatomy of a Brand Campaign". Intel Corporation. Retrieved July 22, 2011. ^ Elliott, Stuart (August 24, 1994). "Intel plans a huge fall campaign for Pentium, its latest and most powerful computer chip". The New York Times. ^ "Intel mulls branding for handheld chips". ^ a b Elliott, Stuart (October 11, 2007). "'Intel inside' ad campaign shifts focus to the Web". International Herald Tribune. Retrieved October 12, 2007. ^ "Intel 2010 Annual Report". Intel. 2010. Archived from the original on September 21, 2011. Retrieved July 23, 2011. ^ Paul Morley (October 19, 2003). "Boot me up, Dessie". The Observer. UK. Retrieved January 17, 2009. ^ Shah, Agam. "Intel's Chip Renaming Strategy Meets Resistance". PC World. Retrieved June 22, 2009. ^ a b Hachman, Mark (June 17, 2009). "Intel Simplifying its Processor Branding". PC Magazine. Retrieved July 6, 2009. ^ Anton Shilov, XBitLabs. "Intel Quietly Starts to Sell New "Unlocked" Core i7 Chip Archived October 26, 2011, at the Wayback Machine." October 24, 2011. Retrieved October 26, 2011. ^ "Intel Font and Intel Logo". fontmeme.com. ^ "Chip Shot: Intel Clear Designed to Optimize Communications". ^ "Intel unveils its new brand typeface - Webdesigner Depot". May 20, 2014. ^ a b Tadena, Nathalie (April 7, 2014). "What's Different About Intel?". ^ "The Inside Story Behind Intel's Proprietary Font Design". ^ "Dalton Maag - Intel". www.daltonmaag.com. ^ "Intel Brand Book - RedPeak". RedPeak. January 1, 2018. ^ "01.org". 01.org. Retrieved November 26, 2014. ^ "FreeBSD Kernel Interfaces Manual". freebsd.org. The FreeBSD Project. November 27, 2005. Retrieved August 5, 2007. ^ a b Intel Corporation. OpenBSD, ed. "if_em.c (Intel PRO/1000 10/100/Gigabit Ethernet device)". BSD Cross Reference, OpenBSD src/sys/dev/pci/. ^ "fxp/fxp-license". BSD Cross Reference, OpenBSD src/sys/dev/microcode/. ^ About Archived June 3, 2008, at the Wayback Machine. Lesswatts.org. Retrieved on July 8, 2011. ^ Varghese, Sam (March 1, 2005). "OpenBSD to support more wireless chipsets". The Age. Melbourne, Australia: The Age Company Ltd. Retrieved August 5, 2007. ^ Robertson, Michael (March 19, 2003). "Is Intel's "Centrino" Techno-Latin for "No Linux?"". michaelrobertson.com. Archived from the original on October 28, 2005. Retrieved August 5, 2007. ^ de Raadt, Theo (September 30, 2006). "Intel: Only "Open" for Business". OpenBSD Journal. Retrieved August 5, 2007. ^ "ipw – Intel PRO/Wireless 2100 IEEE 802.11b wireless network device, Sh FILES". BSD Cross Reference, OpenBSD share/man/man4/. February 15, 2014. Retrieved December 28, 2014. These firmware files are not free because Intel refuses to grant distribution rights without contractual obligations. As a result, even though OpenBSD includes the driver, the firmware files cannot be included and users have to find these files on their own. The official person to state your views to about this issue is majid.awad@intel.com. See also: ipw, iwi, wpi and iwn. ^ King, Ian (April 19, 2016). "Intel to Cut 12,000 Jobs, Forecast Misses Amid PC Blight". ^ "Transmeta Announces Patent Infringement Lawsuit Against Intel Corporation". investor.transmeta.com (Press release). Transmeta Corporation. October 11, 2006. Archived from the original on May 1, 2007. Retrieved July 28, 2007. ^ "Transmeta settles patent suit with Intel". Reuters. October 24, 2007. Retrieved October 25, 2007. ^ "Intel Files Response To AMD Complaint". Intel Corporation (Press release). September 1, 2005. Archived from the original on June 24, 2006. Retrieved July 28, 2007. ^ Whelan, David (September 2, 2005). "Intel's Legal Strategy Takes Shape". Forbes. Archived from the original on October 1, 2005. Retrieved July 28, 2007. ^ "AMD, Intel Battle Wages On As EU Decision Nears" (PDF). AMD. Portfolio Media, Inc. March 20, 2006. Archived from the original (PDF) on February 16, 2008. Retrieved January 7, 2008. ^ Krazit, Tom (September 1, 2005). "Update: Intel issues formal response to AMD's antitrust lawsuit". infoworld.com. IDG News Service. Archived from the original on February 1, 2008. Retrieved January 7, 2008. ^ "Intel, AMD Lawsuit Pushed Off to 2010". eWeek. Retrieved June 12, 2008. ^ a b Shankland, Stephen (November 12, 2009). "What Intel just bought for $1.25 billion: Less risk". CNET News. Retrieved July 29, 2010. ^ "AMD and Intel Announce Settlement of All Antitrust and IP Disputes". Intel Corporation. Retrieved July 29, 2010. ^ "AMD and Intel Announce Settlement of All Antitrust and IP Disputes". Amd.com. Retrieved July 29, 2010. ^ Bill Singer (November 19, 2012). "After Apple, Google, Adobe, Intel, Pixar, And Intuit, Antitrust Employment Charges Hit eBay". Forbes. ^ Levine, Dan (April 24, 2014). "Apple, Google agree to settle lawsuit alleging hiring, salary conspiracy". Washington Post. ^ "EU files new competition charges against Intel". Reuters. July 17, 2008. Archived from the original on December 16, 2008. ^ Europe files more antitrust complaints against Intel – MarketWatch. Marketwatch (July 17, 2008). Retrieved on July 8, 2011. ^ Predatory pricing or old-fashioned competition? –. International Herald Tribune (March 29, 2009). Retrieved on July 8, 2011. ^ "Intel to abide by Japan FTC recommendations". CNET News. Retrieved on July 8, 2011. ^ "Competition: Commission confirms sending of Statement of Objections to Intel". Europa (web portal). July 27, 2007. Retrieved July 28, 2007. ^ a b Lawsky, David (July 27, 2007). "UPDATE 4-EU says Intel tried to squeeze out Advanced Micro Devices". Reuters. Retrieved July 28, 2007. ^ Lawsky, David (July 27, 2007). "Intel says EU made errors in antitrust charges". Reuters. Retrieved July 28, 2007. ^ "EU regulator raids Intel offices". BBC News. February 12, 2008. Retrieved February 12, 2008. ^ "EU outlines Intel 'market abuse'". BBC News. July 27, 2007. Retrieved July 28, 2007. ^ Clarke, Peter (August 8, 2007). "AMD sets up website to tell "the truth about Intel"". eetimes.com. CMP Media LLC. Retrieved August 9, 2007. ^ "AMD Break Free". breakfree.amd.com. Advanced Micro Devices, Inc. July 31, 2007. Archived from the original on July 31, 2007. Retrieved August 9, 2007. ^ Harrison, Pete (July 17, 2008). "EU files new competition charges against Intel". Reuters. Retrieved September 10, 2008. ^ a b c d e "The Chips Are Down: Intel's $1.45 billion Fine". TIME. May 13, 2009. Retrieved May 13, 2009. ^ "Antitrust: Commission imposes fine of €1.06 bn on Intel for abuse of dominant position; orders Intel to cease illegal practices", reference: IP/09/745, date: May 13, 2009. Europa.eu (May 13, 2009). Retrieved on July 8, 2011. ^ "Intel facing antitrust complaint in Korea". The New York Times. September 11, 2007. Retrieved November 21, 2015. ^ Pimentel, Benjamin (June 5, 2008). "Intel fined $25.5 million by South Korea". marketwatch.com. MarketWatch. Retrieved July 5, 2008. ^ Confessore, Nicholas (January 10, 2008). "Intel Gets New York Subpoena in Antitrust Inquiry". The New York Times. Retrieved May 5, 2010. ^ Labaton, Stephen (June 7, 2008). "In Turnabout, Antitrust Unit Looks at Intel". The New York Times. Retrieved December 31, 2008. ^ "FTC Challenges Intel's Dominance of Worldwide Microprocessor Markets". Ftc.gov. December 16, 2009. Retrieved July 29, 2010. ^ "United States of America Before The Federal Trade Commission" (PDF). FTC. Retrieved January 8, 2013. ^ King, Ian (December 16, 2009). "FTC Wants Intel to Repent, Not Pay Up". BusinessWeek. Archived from the original on January 25, 2010. Retrieved July 29, 2010. ^ "Intel in threats and bribery suit". BBC News. November 4, 2009. Retrieved December 18, 2009. ^ "SEC Charges Dell and Senior Executives with Disclosure and Accounting Fraud". ^ Gibb, Gordon (July 24, 2010). "Dell Agrees to $100 in Penalties to Settle SEC Accounting Fraud Charges". LawyersandSettlements.com. Retrieved July 25, 2010. ^ Krantz, Matt; Swartz, Jon (July 24, 2010). "Dell settles SEC charges of fraudulent accounting". USA Today. Retrieved July 25, 2010. ^ Reed, Kevin (July 23, 2010). "Dell pays $100m penalty to settle accounting fraud charges". Accountancy Age. Archived from the original on July 25, 2010. Retrieved July 25, 2010. ^ Corrales Comment 11/25/2006 Intel Pollution Unresolved. ^ "Corrales Comment - Local Village News, Issues, Events & Ads - Intel Pollution Control Shut Down Probed". July 5, 2012. Archived from the original on July 5, 2012. ^ Miller, Joe (January 7, 2014). "Intel vows to stop using 'conflict minerals' in new chips". www.bbc.co.uk. The BBC. Retrieved January 7, 2014. ^ "Intel Sued for Discrimination", Pittsburgh Post-Gazette, January 30, 1993, B-12. ^ a b Alster, Norm, (December 7, 1998). "Techies complain of age biases" Archived May 22, 2009, at the Wayback Machine, Upside Magazine. Retrieved on July 8, 2011. ^ Weinberg, Neal (September 14, 1998). "Help Wanted: Older workers need not apply". CNN Retrieved on July 8, 2011. ^ Goodin, Dan (April 28, 1999) "Court blocks former Intel employee's spam". CNET News. Retrieved on July 8, 2011. ^ Kasli, Shelley (August 10, 2016). "Rothschild Inside, Garbage Outside". GreatGameIndia Magazine. ^ Bell, Kay (August 10, 2016). "Indian city raises stink over Intel's unpaid taxes". Don't Mess With Taxes. Retrieved 10 January 2017. Wikimedia Commons has media related to Intel.